Lemon, like vinegar, is a terrific cleaning agent. The acid in lemons is antibacterial and antiseptic, and it acts as a natural bleach. The citrus smell of a lemon is refreshing and invigorating. Oils in the rinds can also help to clean and shine. Add a little salt, and you can throw away many of the harsh, chemical-based products in your cleaning bucket. There's just one caveat to bear in mind. While lemons and lemon juice can do a great job with many household chores, it is not a disinfectant. In other words, it is not a good substitute for bleach or related products when you are actually trying to remove dangerous microbes from cooking surfaces. Because food safety is important, be sure to hang onto appropriate cleaning products and use them as needed. Lemons are not always cheap. If you're planning use lemon juice but don't need the fresh fruit, consider buying large quantities of lemon juice from concentrate at a local discount store. If you do decide you need whole lemons, you can often buy them by the bag for a bulk rate. Remember: you're not eating them, and a few brown spots won't lessen their cleaning power. While you're at the store, also pick up a container of plain table salt. Don't bother with the special sea salt or kosher varieties, as your sink won't know the difference! Lemons have an incredible range of household uses. Here are just a few. Clean copper-bottom pots and pans: Clean copper-bottomed pots and pans with lemon juice. Copper fixtures can also benefit from a lemon juice cleaning. Cut a lemon in half. Dip it in some salt, and clean spots from your copper. This same mixture of lemon juice and salt, by the way, can also be used in coffee makers, microwaves, and food storage containers. Add the mixture to vinegar: Vinegar can be a great cleaning ingredient, but many people dislike the vinegar smell. Adding lemon juice to vinegar when cleaning can help neutralize the vinegar smell. Countertops: Countertop stains can be removed by allowing lemon juice to sit on the stain for a few minutes. Scrub the area with baking soda and watch the stains disappear. Don't leave the lemon juice sitting for too long. It can be powerful stuff. Drains: Lemon rinds can be ground in the garbage disposal to freshen the drain. Hot water with a little lemon poured down a drain will also freshen the drain. Bleaching: Lemon juice acts as a natural bleaching agent. Put lemon juice onto white linens and clothing and allow them to dry in the sun. Stains will be bleached away. Degreasing: The acid in lemon juice cuts through grease and does a good job removing grease from the stove and countertops. 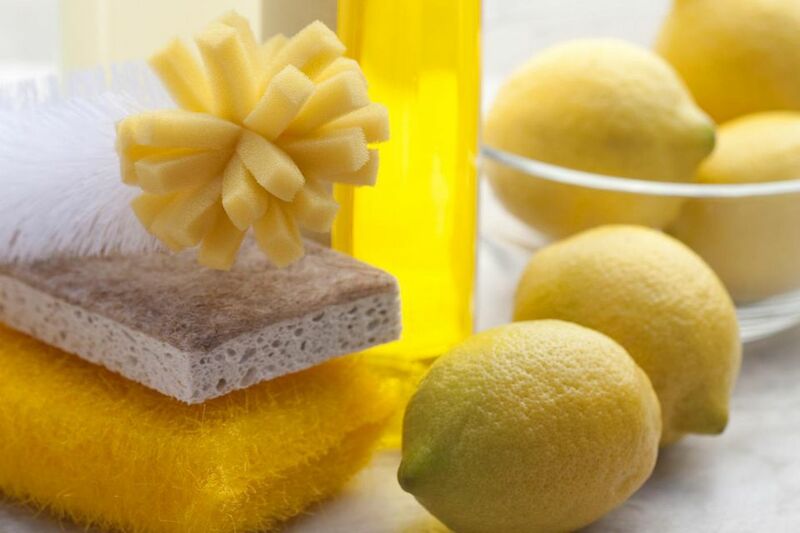 Glass Cleaning: With or without vinegar, lemon is a pretty good glass cleaner. If you do decide to add vinegar to the solution, the pleasant smell of lemon cuts through the not-so-delightful smell of the vinegar. Which Type of Bleach Should You Use?